When traveling about town, and the vehicle detects a possible collision, the braking system automatically engages to apply the brakes and prevent an accident. In other words, the vehicle protects the occupants in the event that a driver is unaware of a potential disaster or becomes temporarily distracted. The front-end camera system continually monitors the front of the Equinox. Drivers receive an alert should they drive to close to the vehicle in front of them. You may drive down the highway and accidentally veering into the wrong lane. 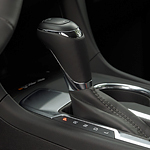 Explore Chevy safety features in the new Equinox by visiting Cook Motor Company and going for a test drive.